If you travel to Japan from abroad (and especially the United States) you will probably arrive at Narita International Airport, located in Chiba prefecture in the Kanto region of Honshu Island. Narita Airport is located about 90 minutes from Tokyo's Shinjuku station by express train, which makes its official name—Tokyo Narita International Airport—seem dubious at best. Close to Tokyo or not, Narita Airport remains Japan's most important international gateway, a fact that makes the "Welcome" message passengers receive upon landing at the airport's easternmost runway seem all the more puzzling. 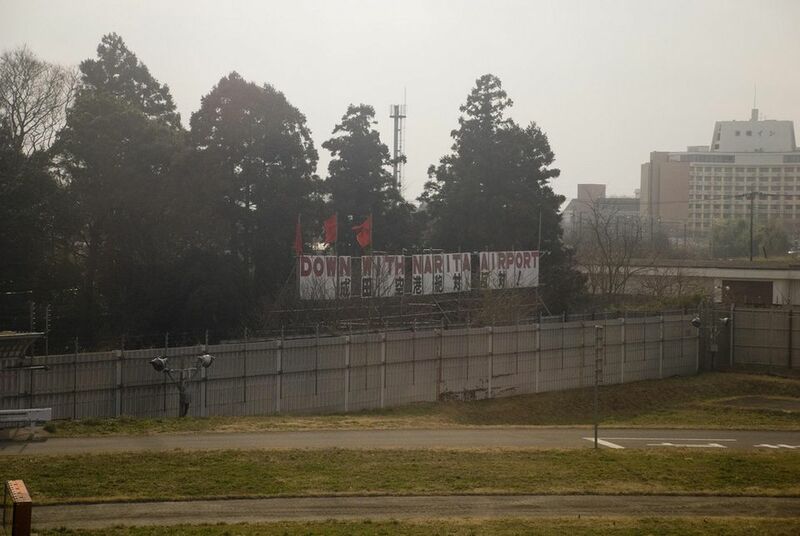 Down With Narita Airport! it reads in big, bold letters, in both Japanese and English. The ominous welcome of this Japanese airport sign notwithstanding, you won't notice much out of the ordinary upon your arrival at Narita Airport, save for the fact that the airport's terminals (especially Terminal 2) seem less than ultra-modern. Looking back into the history of Narita Airport, however, makes you realize this is no ordinary piece of civilian infrastructure. As most governments do, Japan's attempted to exercise a sort of eminent domain over the people who lived in the airport where the then-planned airport during the 1960s. While many of them put up a hard fight, most eventually succumbed to the reality that Narita Airport was going to be built, and took their settlements—and thus, the Japan airport planted where it is today. Most, but not all. The "Down With Narita Airport" Japanese airport signs, you see, are not actually at the airport. The fenced-off plot of land they sit on actually still belongs to its private owner. It's one of many spots on the airport grounds, a list that also comprises a Shinto shrine, two private homes, several farm plots and an agricultural product manufacturing plant, that have technically prevented the airport from being completed. Narita Airport was originally planned to have two 4-km runways among its five total runways when it opened in 1978 (an opening date, it should be noted, that was delayed seven years in and of itself), but the second one didn't open until 2002, and even then it was only half its original length. This did damage to the capacity for Narita Airport to expand in accordance with its master plan, and some experts believe it might've affected the tourism and business travel sectors of Japan's economy. If you know anything about the modern airports of Japan, you'll realize that all of the large ones—namely, Osaka Kansai and Nagoya Centrair—were built on artificial islands. This is not simply because Japan loves pushing the engineering envelope, but because the Japanese government learned its lesson from the contentious process of attempting to build Narita Airport on land. Unfortunately, Narita's still-incomplete status and dim prospects for future expansion have another implication. Narita's main competitor, Tokyo's Haneda Airport (which is much closer to the city), recently re-opened itself to International Flights after several decades. This is ironic, as Narita was built so that Haneda could transition into a mostly domestic airport. In any case, many airlines are choosing to move to Haneda whenever slots open up, which raises concerns about whether Narita Airport will be able to compete long-term, given its distance from Tokyo, as well as its quickly-aging facilities. The Japanese government, for its part, has accelerated the opening of Haneda slots, as a result of the forthcoming Tokyo 2020 Olympic games. Does this mean that Narita Airport is doomed to close, or "go down" as it were? Absolutely not, as Narita Airport is busting at the seams to this day, and Narita Express trains to central Tokyo are also packed to the gills. Still, it seems the people who put up the "Down With Narita Airport" Japanese airport signs will get their wish, if only in a small way.